To enter scores, go to your Team Page. If you are logged in you will see a button on the top left corner that says "edit/user". Click to enter "edit mode". Once you are in edit mode, go to "Game Schedule" on your team page. This will go to your list of all of your games for the season. Find the game that you are wanting to score. Click on QS (Quick Scores) on the far right side. Enter your scores. Click “Final” then"Save". It is the Home Team that should post the scores. If after 24 hours the Home team has not entered the score then the Visiting Team May enter the score. If you require help, contact scheduler@ndbaseball.com. First download the Sportsengine App. If you are logged in and have gained permission to enter scores, go to your team. Press Schedule then the game you what to score. Press on the ‘Pen’ icon to edit the game. If you do not see your team, please email the scheduler to resend a team invitation. When you are in your team page you can go to your Control Panel by pushing the button ‘Manage Team’, at the top right, when in Edit Mode. Once you are in your teams schedule page press the game you want to change, then push he ‘Pen’ symbol on the right side. This allows you to cancel or postpone games, move the game date, etc. These changes will also affect the other team so please make them aware of any changes. 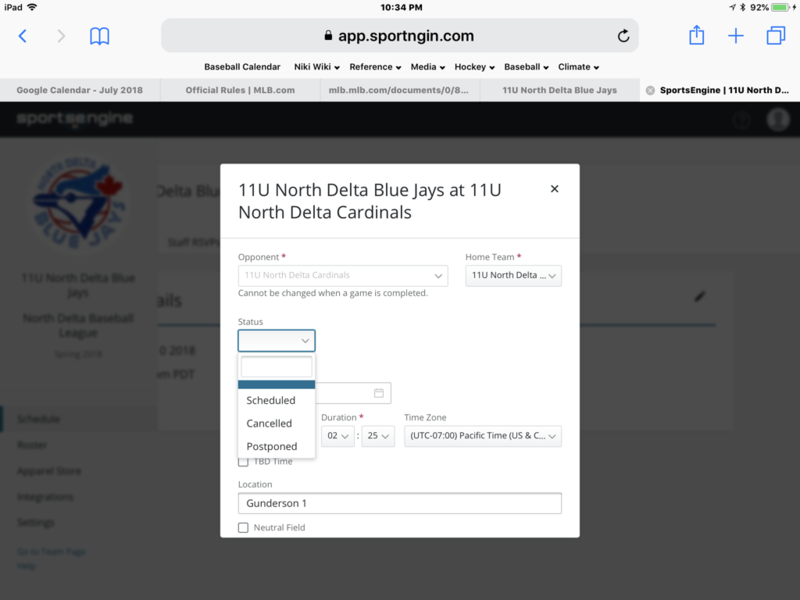 ©2019 North Delta Baseball Association / SportsEngine. All Rights Reserved.